Worrying excessively about health, and going for unnecessary appointments and tests, is a growing problem - fuelled by looking up symptoms on the internet, researchers say. Health anxiety can also be caused by previous health scares and could affect one in five hospital out-patients. UK researchers said psychotherapy could reduce anxiety and should be on offer in all hospitals. They are calling for official health anxiety guidelines to be drawn up. 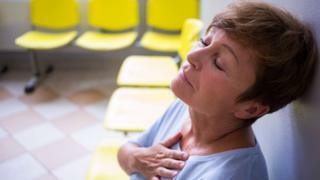 A team including researchers from Imperial College London and King's College London said the symptoms of health anxiety were often mistaken for those of a physical illness and included chest pains and headaches that didn't go away. Even when a doctor offered reassurance that there was no underlying physical reason for their symptoms, patients continued to worry and look for a diagnosis. And this led to expensive and unnecessary medical appointments and investigations, as well as time off work, they said. Prof Peter Tyrer, emeritus professor in community psychiatry at Imperial College London, said the internet had a part to play. "We suspect that [health anxiety] is increasing in frequency because of what is now called 'cyber-chondria'. "This is because people now go to their GPs with a whole list of things they've looked up on the internet, and the poor GP, five minutes into the consultation, has four pages of reading to do," he said. Prof Tyrer said patients didn't tend to pay attention to the word "rare" if they thought they had a disease. The researchers, mostly mental health experts, said it was important to identify people with health anxiety and offer them treatment so their overall wellbeing improved. They estimate that the problem could be costing the NHS at least £420m a year. In their study, published in the National Institute for Health Research journal, they found that cognitive behavioural therapy (CBT) sessions were much more effective at improving health anxiety than standard care, and the benefits lasted for up to five years. They tracked 444 patients with severe health anxiety from five hospitals in England. Nurses were just as good at delivering CBT as trained psychologists and doctors, the study suggested. Prof Tyrer said official guidelines on how to treat health anxiety, from the National Institute for Health and Care Excellence (NICE), were "greatly overdue". He said health anxiety was common in those with other physical illnesses, but was often ignored. "So people, after apparently successful treatment of heart attacks, would interpret minor symptoms as warnings of further attacks, cut down on all their activities, create more suffering and have their lives thrown into chaos and disarray." The researchers urged doctors to ask patients whether they were anxious about their health. They said people were increasingly asked to monitor their own bodies for symptoms and diseases, and that was also fuelling health anxiety. Prof John Chambers, consultant cardiologist at Guy's and St Thomas Hospital, said health anxiety caused repeated attendances in accident and emergency departments, GP surgeries and out-patient clinics and led to "over-investigation by clinicians". He said they should consider a psychological explanation and a psychological intervention instead. "These then need to take place locally and not at a site distant from the patient's presentation, so as to avoid the implied but unhelpful mind-body separation," he said. NICE said its website featured guidance on general anxiety disorder (GAD) and panic disorder in adults that could be relevant. It said NHS England had to refer specific topics to it before it could decide whether guidance was appropriate.